In April 2012, Kelli Malone of Lindale, Texas wrote to me about an oil painting that she had recently purchased at a garage sale in her area. Kelli wrote, “East Texas has many flea markets, garage sales and trades days, which I love to attend. My husband and I were out one Saturday, looking for unique things that people have to sell. It was getting late, but I convinced my husband that we should stop at one more garage sale. According to Nunzio LoCastro, the first cousin of Costantino Proietto, the artist was prolific. On his business card, he listed his German title as “Kunstmaler”, which translates into English as “production painter”. 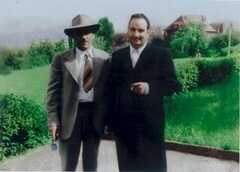 While stationed in Germany with the U.S. Army between 1951 and 1953, LoCastro regularly visited his Cousin “Tino” in Stuttgart. Nunzio LoCastro tells us that Tino Proietto could finish a small painting in a day, while it might take two days to complete a larger work. After an eighteen-year, unpaid apprenticeship to an art restoration specialist in Randazzo, Sicily, Costantino Proietto settled in Germany before World War II. By the early 1950s, Tino had both an apartment and a separate atelier, where he painted. He produced paintings of “what people wanted to buy”, which included landscapes of well-known Italian and Swiss scenes. Until Easter each year, Costantino Proietto painted six or seven days each week. In the early days, he would then load up his automobile and peddle unframed paintings to individuals and galleries throughout Germany. After his spring sales trip, Costantino would again paint daily until fall. He would then repeat the mobile sales process, with much of his fall collection sold to holiday shoppers. From the 1940’s until the 1970’s, Tino Proietto kept up that pace. By the 1960’s, he joined exhibitions of framed art at various Allied military bases throughout West Germany. Although he died in 1979, Costantino Proietto continued to paint until at least the mid 1970’s. If C.Proietto painted only 100 pictures each year for forty years, that would bring his total to 4000 original oil paintings. My guess is that 4000 paintings would be a minimum, with the possible number of C.Proietto works at least twice that high. The artist, who did not care about fame, priced his works within the reach of soldiers and citizens. According to Nunzio LoCastro, Cousin Tino was an energetic and dedicated artist who regretted nothing in his life. With each newly discovered C.Proietto painting, we learn more about the artist and the pleasure that he brought to so many people around the world. 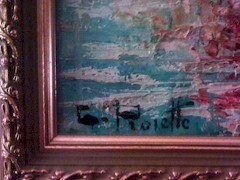 In order to authenticate the Malone C.Proietto painting, I looked first at the signature. 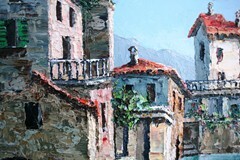 As is characteristic with all known C.Proietto paintings, he used a palette knife to execute his signature. Note the strong horizontal lines on the letter “C”. The “dot” is in line with the finishing stroke of the “C”. The “P” is larger than the “C”. The lower horizontal line within the “P” appears as an oval. The “i” is un-dotted. The crossing of the “tt” becomes an upward-rising slash. The bottoms of the letters in “Proietto” form a near-perfect horizontal line. Since these signature characteristics appear in all authentic C.Proietto paintings, I felt certain that the painting was genuine. The content and style of the Malone C.Proietto are consistent with the artist’s other known works. The scene features both water and sky. It also contains strong architectural elements in the middle ground and background. The aspect ratio of the painting is similar to standard 35-mm photographic film. Using photographic prints as models C.Proietto almost always painted in his studio. If you observe the basilica and its outbuildings, you will see a masterful use of texture, color and form. Convinced of its authenticity, I offered to purchase the painting from Kelli Malone. In mid-June, a UPS parcel containing my new C.Proietto masterpiece arrived. The only obvious flaws on the painted surface were a chip of missing paint below the bridge and some cracks in the painted sky. According to Nunzio LoCastro, the painter was a chain-smoker. To accelerate aging of his works and perhaps anticipating later smoke damage, Tino Proietto often mixed his cigarette ashes into the paints on his palate. This pre-aging appears around the Archangel Michael atop the castle. Not recognizing the scene in the painting, I displayed it for guests at a recent dinner party. One individual immediately recognized the scene. In the foreground is the Tiber River, in Rome, Italy. The bridge is the Ponte Sant’Angelo, once the Aelian Bridge, completed in 134 AD, by the Emperor Hadrian. On the right bank of the river is the Mausoleum of Hadrian, completed in 139 AD, one year after the death of Hadrian, himself. Today, the imposing structure is the Castel Sant’Angelo, featuring a statue of the Archangel Michael by the 18th century Flemish sculptor Pieter Verschaffelt atop its ramparts. From the fourteenth century onward, various popes used the mausoleum as a fortress and castle. In the background of the painting is a timeless image of the grand dome of Basilica San Pietro, in Vatican City. Costantino Proietto painted in a Stuttgart studio that featured large windows and northern light. As he painted, light would shine through the canvas from behind. Depending on the effect that the artist desired, he would leave some portions of the canvas almost free of paint. This technique allowed more or less light to shine through from behind. Hoping to discover what Costantino Proietto intended while painting this iconic Roman scene, I placed a lamp behind the picture. Utilizing my crude backlighting technique, the original afternoon scene turned to dusk. The current of the Tiber River reflected back to me in fading light. Horizontal lines on the buildings and the bridge glowed, as if lit from within. Reflecting his genius as a master of the palate knife, alternate images may appear on a single C.Proietto canvas. Many thanks to Kelli Malone for helping to advance our knowledge of twentieth century impressionist master, Costantino Proietto. Recently, Ms. Jennifer Malloy sent me two images of her family’s Costantino Proietto original oil painting. With help from Google Maps and Google Images, I have determined that the main subject of the painting is the Basilica di Santa Maria della Salute, in Venice, Italy. The view of the basilica is from across Tronchetto - Lido di Venezia. In the foreground, a gondolier plies a covered craft across the ripples of the lagoon. In the middle ground, sailboats hover in the dying light. Some distance behind the sailboats is the grand basilica, bathed in reflected pink light. Originally, both Jennifer Malloy’s father and I believed that his painting was of St. Mark’s Basilica in Venice. However, using aerial views from Google Maps, I could not reconcile the painted image with photos of St. Mark’s Basilica. As viewed from across the water, the domes in the painting did not match those of St. Mark’s. Unless hidden behind the painting's sailboats, the skyline-dominating Campanile was missing. Broadening my photo search of Venice, I soon found a match with the Basilica di Santa Maria della Salute. For an aerial view of the basilica, click this link. As viewed from the Chiesa del Redentore, across the “trunk” to the southwest, Santa Maria della Salute matches well with this C.Proietto painting. Even the lighthouse, to the right in this painting, is in proper perspective. With such conclusive photographic evidence, I believe that this painting features Santa Maria della Salute. According to artist’s cousin, Nunzio LoCastro, pastel paintings by Costantino Proietto are rare. In the artist’s early days in Germany, during World War II, brightly colored oil paints were rare. After the war, when new paint formulas became available, the artist’s paintings included lighter and brighter colors. Together, St. Mark’s Basilica, its plaza and bell tower make up the iconic scene of Venice, Italy. Even so, Claude Monet selected Basilica di Santa Maria della Salute for a series of early-twentieth-century paintings. 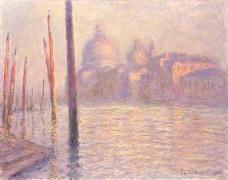 The Monet series depicts the basilica as viewed from across the Grand Canal, looking south. Since Tino Proietto painted from his own photographs, we can imagine him on the water at sundown, taking pictures of the basilica with his vintage Leica camera. To some, C.Proietto's Venice scene may seem fantastic and surreal. I believe that it is an accurate impression of what the artist saw and photographed one evening in Venice. After researching and writing this article on the Malloy Family C.Proietto painting, I went back to my photographic archives and made a worthwhile discovery. 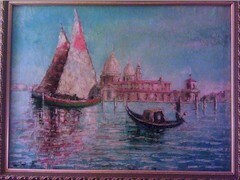 There, among many other paintings in the LoCastro collection, I discovered another C.Proietto painting of Venice. The final painting on this page is a Costantino Proietto painting of St. Mark’s Basilica, the plaza and Campanile. In contrast to the pastel sunset at Basilica di Santa Maria della Salute, the St. Mark’s painting shows a rising sun. Undoubtedly, the Malloy Family C.Proietto is another of Tino Proietto’s masterworks. 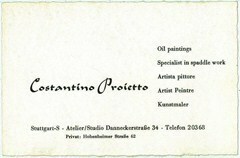 With notable humility, Costantino Proietto’s 1960 era business card represents him as a “Kunstmaler”. Translated from German to English, the word means “production painter”. Over his five decade career, Tino Proietto’s output was indeed prodigious. Despite the large number of C.Proietto paintings in existence, I expect the international art community to recognize him as the grand master of “spaddle work” and a great mid-twentieth-century artist. In July 2011, I published my first article regarding the Italian artist Costantino Proietto (1910-1979). Other than the signature “C.Proietto” on our own original oil painting, I then knew nothing about this modern Italian impressionist. 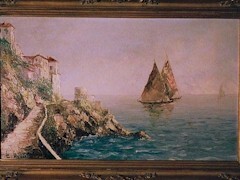 At that time, I published pictures of our Amalfi Coast painting, asking other owners of C.Proietto paintings to share them with our world and me. Soon, several individuals in the U.S. came forward with photographs of their own treasured C.Proietto masterpieces. U.S. soldiers stationed near Stuttgart, Germany purchased each of those initial paintings there. Some people would write and promise to send pictures, but never deliver. One man sent stories about his family’s close relationship to Costantino Proietto, who they called “Uncle Tino”. There was a story about a dark painting designed not to hurt the eyes of a young measles patient. At the Sistine Chapel in Rome, using real gold leaf, Tino had painted an image of the Madonna. I had only one unconfirmed photographic image of a balding man in his mid to late sixties. If that picture was of Costantino Proietto, I could not prove it. Now, I believe it to be a later image of the man. 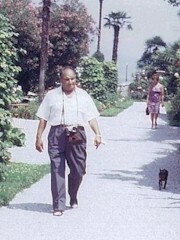 In March 2012, I received letters from two relatives of Costantino Proietto, each of whom knew the artist in life. With their stories, Larry LoCastro, second cousin, and Nunzio LoCastro, first cousin of Costantino Proietto brought life to the artist and the man. Within the LoCastro family in New Jersey, there are almost a dozen signed original oil paintings attributed to the artist. Although there are too many new paintings to show them all here, I will post the remaining works in later articles. Nunzio LoCastro is now eighty-five years old. In 1951, U.S. Army service took him to Germany for two years. Before shipping out, his father told Nunzio to look up a cousin who lived in Germany. That cousin, an Italian emigrant to Stuttgart, Germany was the forty-one year old Costantino Proietto. Having settled in Stuttgart near the beginning of World War II, C.Proietto quickly established himself there. By the early 1950s, he painted at his own atelier/studio, located at the fashionable address, Stuttgart-S. Danneckerstraße 34. Through the wonders of Google Street View, we can see that building as it looks like today. According to one person who photographed it, in 1899 architect Gottlob Schäufelin finished the mehrfamilienhaus (multifamily property), which later housed C.Proietto’s studio. In describing the studio, Nunzio LoCastro told me that it was had one large room with many windows. According to Nunzio LoCastro, Tino painted on the first floor of that building. According to Nunzio, Tino lived with his common law wife Gisela at Stuttgart-S. Hohenheimer Straße 62. There we see a four-story apartment building, which dates to the prewar era. Again, with the aid of Google Maps, we can see that his home and studio were only two hundred thirty meters apart. Every day, Tino would rise early, have a cup of black coffee and then walk to his studio. There, he would paint until noon and then return home for lunch with Gisela. After a leisurely lunch, Tino would don a freshly ironed shirt and return to his studio. Painting there until the sunlight failed, Tino would then go out on the town, enjoying whatever nightlife postwar Stuttgart had to offer. During his evening activities, Gisela was at home. By then, Tino had come to expect a spotless house and two freshly washed and ironed shirts each day. Since he often worked seven days a week, I imagine Gisela at their apartment boiling, washing and ironing shirts well into the night. Although many artists wear a smock, Costantino created his masterpieces while wearing a dress shirt. After work he was still impeccably dressed for a night on the town. With his signature palette knife work, C.Proietto brought elegance, skill and exactitude to his work. For him, creating modern impressionist masterworks in a dirty shirt was unacceptable. 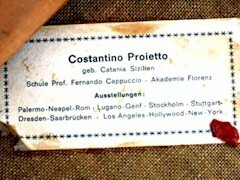 The business card of Costantino Proietto, as displayed on this page, tells us how the man saw himself. On the card, “Costantino Proietto” appears in bold script. The top two entries on his list are in English. First is “Oil Paintings”, followed by “Specialist in spaddle work”. Next, in his native Italian, is “Artista pittore”, meaning “painter of pictures”. In a nod to the French, he follows with “Artist peintre”. Finally, for his host country, Germany he lists “Kunstmaler”, meaning artist, painter or “production painter”. In less than one year, Costantino Proietto and his works have gone from obscurity to fame. Soon, I expect him to be among the most collectable of twentieth century painters. We can now confirm Randazzo, Sicily 1910 as his place and year of birth. We know that at age fourteen he began an eighteen year unpaid apprenticeship to a master Italian artist and art restorer. In his early thirties, C.Proietto immigrated to France, and then to Switzerland. By 1942, he had settled for good in Stuttgart, Germany. By 1951, he had a studio and a nearby apartment home. According to his cousin Nunzio LoCastro, every day, Tino Proietto lived the good life, traveling, photographing and painting exquisite pictures of scenes that people loved. Any observer of an original painting by C.Proietto can see and feel his joy in life shine through.